Our Wig Center is located on 128 E Beverley St, Staunton, Virginia inside the Staunton School of Cosmetology. The Cosmetology Industry is constantly changing. Fashion trends, and lifestyles are a big part of why this change has occurred. Artificial Hair enhancements have been increasing in demand. Fashion designs and medical needs are a large part of why this has to rise. As the demand for these products increased, the School included a Wig Center in the training facility. Students learn how to care for, style, cut and fit wigs for today’s client. Industry professionals consider this an important part of the students education. Students also learn how to deal with sensitive issues the client may be facing when the decision is made to use a wig or hair enhancement. They also learn about scalp and hair care that is necessary for the client with medical issues. The student is assisted by the Teacher as they learn about wig selection and any accessories the client may need. 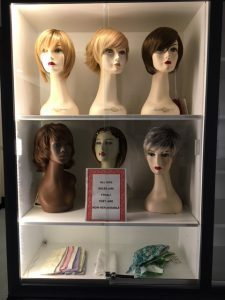 The Wig Center is for clients suffering from hair loss due to medical treatments and for those who have special hair care needs. Treatments can cause the hair to become brittle so it is important to shop before you begin the treatments. Partial and total hair loss may sometimes occur. The Wig Center will help the client determine their needs. They will receive assistance from a professional stylist in helping them select their wigs, accessories and products. Scalp and hair care are important during this time. Products that are gentle to the hair and scalp are necessary. The stylists will help the client in their selections so they will be the most beneficial for their needs. Wigs and hair additions are popular items. They are used for special occasions such as weddings, proms and competitions. They can also be used for a “quick fix” on a bad hair day or just for a change. When a client with a medical condition must purchase a wig, the shaping and a haircut are included. The haircut is done on the client and the shaping is done on the wig. All other clients will receive just a wig shaping with the purchase of a wig. The stylist will also help the client with any products and accessories they may need. A line of accessories will be available such as hats, scarves and turbans. Some items will need to be ordered.